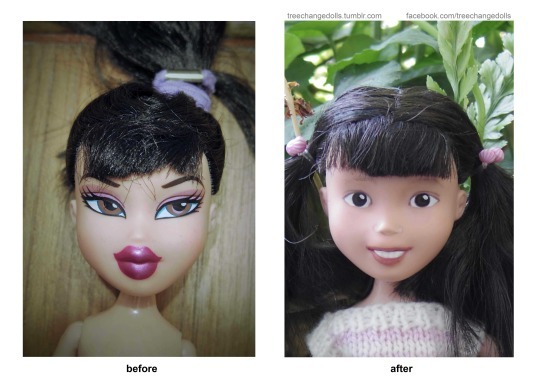 Yesterday I came across this story of a sweet woman who rescues forgotten Bratz dolls and gives them “make-unders,” redeeming them to be lovely, clear-eyed, and wholesome. You may have seen it. I viewed her video several times because it made me so hopeful for our broken world. It was such a vivid picture of grace. In what this woman does with these discarded dolls, I see a glimpse of the gospel. The way she scours thrift shops, finds them naked, hair gnarled, limbs missing, and brings them into her home. 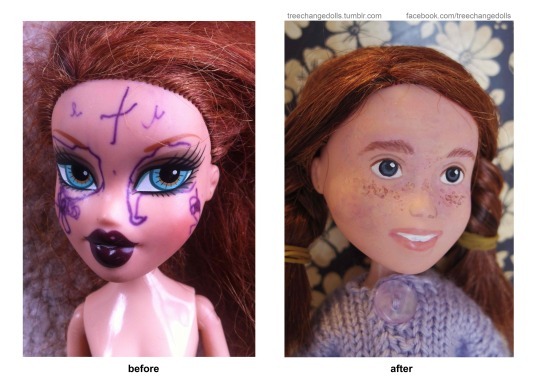 The way she washes them, tenderly erases their sleepy bedroom-eyes and puffy cartoon-lips, paints them a new, bright and happy face, restores their missing parts, and adorns their exposed bodies in adorable hand-knit outfits. Every detail is attended to; nothing is overlooked. After undergoing what C.S. Lewis would call “the full treatment,” these dolls are made completely new. There is not a trace of the old, hyper-sexualized “brat” that existed before. In these broken, jacked-up dolls, I see myself. In the benevolent demeanor of the woman who rescues these dolls, I see Jesus. He too, is a humble, skillful artist, grace-giver, and savior. He too, gives life to what was dead and transforms what seems like hopeless rubbish into breathtaking beauty. And he does so with the human heart. Found. Rescued. Washed. Cleansed. Transformed. Made new. that she may be reborn. she is loved and seen.